Finger Painting – Marc Schuster, etc. One thing I didn’t mention about “Art Face” was that I finger-painted it. That’s actually my preferred mode of painting, largely because I don’t like cleaning my brushes. 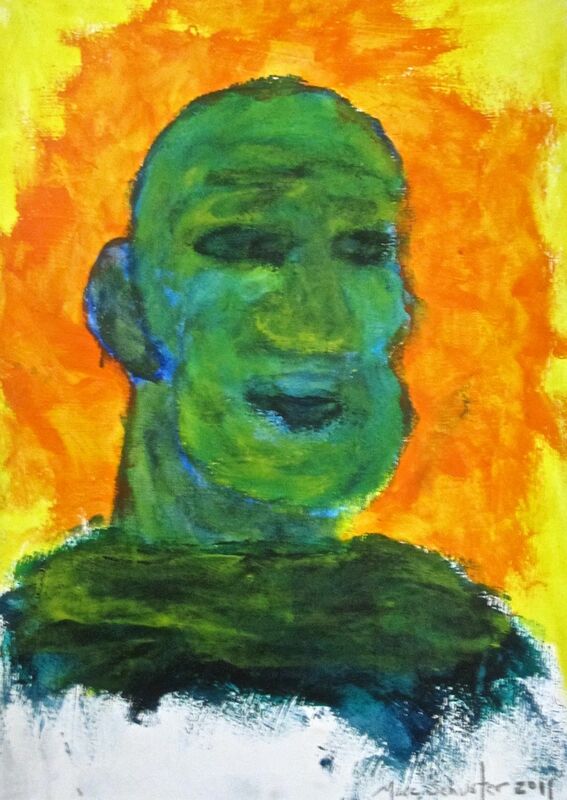 Here’s another portrait I finger-painted. I did this one last June. Cool! Looks like some famous historical figure. Now, if only I could come up with a NAME…. I don’t know how you do it; I struggle with stick men! Here I thought finger painting was for kids. I never saw one with such detail. Fabulous! I can paint with words all day, but have never been able to get what I see in my mind on paper. Pencils, pens, watercolors, oil paints…nothing. I can’t draw a tree, even my stick figures are questionable. I haven’t tried finger paints though. Maybe I should give them a try. Your “Art Face” takes finder painting to a whole new level. Great detail!